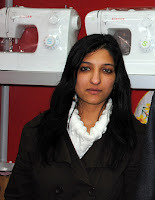 I recently bought a sewing machine, actually it is my second sewing machine. My first one was a Singer Mars II, it was OK for my simple sewing projects, mostly table runners, pillow covers and sometimes a skirt. I wanted a stronger machine for more challenging projects: bags. Making bags means sewing through many thick layers of fabric, lining, interfacing, leather, straps, zippers, cords etc. I usually do a lot of online researching before buying a gadget for myself, and I read a lot of reviews and comments on forums over internet, I watched videos on YouTube, and finally I decided on a Janome, model 423s. I found a Janome dealer's address in Ankara. Most of sewing machine sellers and dealers are in an old district of Ankara called Ulus. It was quite late when I bought the machine and frankly speaking the guy from shop wasn't very helpful, I guess he was already thinking the dinner... but I was too excited to get this machine as soon as possible. I am not a very experienced sewer, but I also can't say I haven't previously used a sewing machine... Sadly I got stuck with sewing many thick layers of fabrics: I got many ugly loops on the under side of the fabric. And so my Sisif work began: I changed the tension, re-threaded the bobbin, re threaded the needle, changed the needle, tried to use the zipper foot, tried to support the foot with a ruler, tried to sew on the lining too but every time I got those many ugly loops on the under side of the fabric. The foot couldn't be lowered too much as the thickness of the layers wouldn't permit this. I asked questions on sewing forums over internet, and nice people really tried to help me with their advices but it didn' help much. 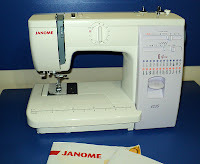 The best advice was to take my sewing projects and go to a Janome dealer/service and show them the project and ask for their help.I didn't go to the Janome dealer from where I bought my machine, I was lucky to found another Janome dealer. They listened to me and my pain. This 3 guys make the difference. The lady from left patiently showed me how to adjust the thread from bobbin by using a small screw driver. God knows I had tried so many ways but it didn't cross my mind that the bobbin thread's tension could be adjusted too. The guy was so patient too, he even taught me how to do free embroidery. Three times I came over to their shop and today I asked their permission to write about them and to take their pictures. Sometimes, being a foreigner isn' very easy, different cultures, communication issues, but nice people can make a big difference. This young lady sat down beside me for hours and showed me how to adjust my machine. She was nice enough tolet me have her personal cell no so I could call her whenever I would need help with my sewing projects. 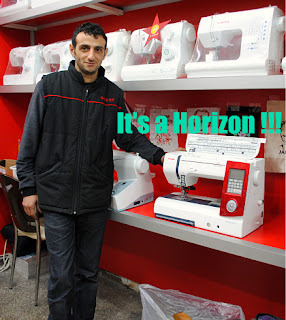 Did İ mention that İ saw and touched the sewing machine of my all dreams: a Horizon? İt is really a piece of jewelry and İ hope when İ will grow up İ will get one. The AccuFeed system is amazing. Feeds your top layer of fabric in perfect sync with the bottom on everything from thick quilt sandwiches to fine heirloom fabrics. Address: Hükümet Cad. No: 5/20, Ulus, Ankara. I'm glad that the second dealer was so helpful and that they explained how to make adjustments to your machine. Actually I didn't realise you'd bought it in Ankara - I thought it was in Romania! Anyway, I've read reviews about the model you bought and it's supposed to be a very good one. Enjoy your sewing and looking forward to seeing your creations on your blog. Congratulations with shopping. Btw I have Janome too but mine is easier.